The All-Girl Filling Station's Last Reunion: by Fannie Flagg | Conversation StartersAs she approaches her 60th birthday, Sookie seems to have this life thing figured out. She is married with four grown children,and her biggest concern is trying to get her overbearing mother to move into a nursing home. Then one day, Sookie learns a family secret that causes her to rethink her entire existence. Readers go on a journey across the country and back in time with Sookie in her quest to find her true identity. Fannie Flagg manages to mix fiction and history in this soul-searching, heartwarming, and funnyNew York Times bestseller...A Brief Look Inside:EVERY GOOD BOOK CONTAINS A WORLD FAR DEEPERthan the surface of its pages. The characters and their world come alive,and the characters and its world still live on.Conversation Starters is peppered with questions designed tobring us beneath the surface of the pageand invite us into the world that lives on.These questions can be used to...Create Hours of Conversation:• Foster a deeper understanding of the book• Promote an atmosphere of discussion for groups• Assist in the study of the book, either individually or corporately• Explore unseen realms of the book as never seen beforeDisclaimer: This book you are about to enjoy is an independent resource to supplement the original book, enhancing your experience of The All-Girl Filling Station's Last Reunion. 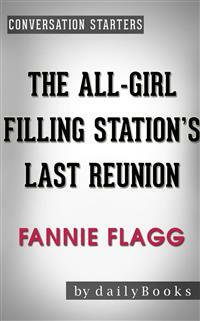 If you have not yet purchased a copy of the original book, please do before purchasing this unofficialThe All-Girl Filling Station's Last Reunion: A Novel by Fannie Flagg | Conversation Starters. FREE Download: Get the Hottest Books! Get Your Free Books with Any Purchase of Conversation Starters! Every purchase comes with a FREE download of the hottest titles! Read it for FREE on any smartphone, tablet, Kindle, PC or Mac. No purchase necessary - licensed for personal enjoyment only. Please Note: This is an unofficial conversation starters guide. If you have not yet read the original work, please do so first. Copyright © 2015 by DailyBooks.All Rights Reserved. We hope you enjoy this complementary guide from DailyBooks. We aim to provide quality, thought provoking material to assistinyour discovery and discussions on some of today’s favorite books. No part of this publication may be reproduced or retransmitted, electronic or mechanical, without the written permission of the publisher.